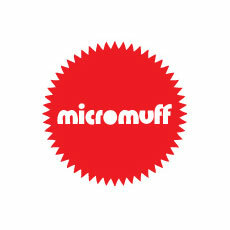 Micromuff - Original Buy One Now! Micromuff Originals on the Canon EOS R - check the video below to see how a pair of Micromuff Originals deal brilliantly with a very windy beach on the South coast of England - get a double pack today at a discounted rate!! Micromuff Originals - Wind noise reduction on a Canon EOS R from will hutchinson on Vimeo. Micromuff Original on the Canon EOS 5D mkIV - check the video below to see how a Micromuff Original deals brilliantly with a very windy beach on the South coast of England. Windprrof your 5D today! Micromuff Original - Wind noise reduction on a Canon 5D mk4 from will hutchinson on Vimeo. Originals are now available in a discounted DOUBLE PACK! Perfect to keep as a spare, gift to a friend or when you need to 2 for cameras with stereo microphones like the brand new Canon R & the Sony A7 range! "If you’re partial to the occasional spot of video, the Micromuff is a godsend, thanks to its ability to muffle the cameraman’s worst enemy, wind. Affordable and easy to use – all cameras should have them as standard." "Gimmicky name, quirky look but incredibly effective windscreen for your outdoor video shoots. Once we got over the tongue-in-cheek name, we found that this little furry chap is brilliant at eliminating wind noise from the built-in microphone when shooting video." Built with the highest quality materials. 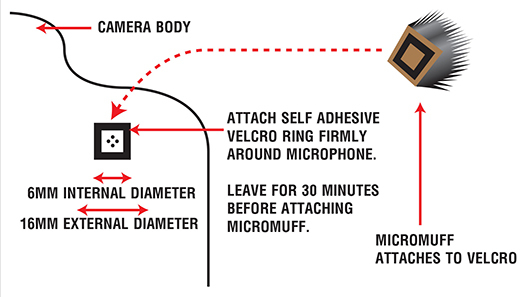 Micromuff ® uses Velcro ® brand fixings for a dependable and long-lasting fix which is easily detachable and reuseable. Micromuff ® uses the best quality, high-density, close-pile acoustic fur for the best wind baffling qualities with minimal sound colouration. All Micromuff ® fur is cut using a specially developed and unique cutting technique to provide the most accurate quality-controlled discs. This process means Micromuff ® wind baffles are the only solution to retain the full density and length of fur from edge to edge - with the result that your windproofing is dependable from any angle. 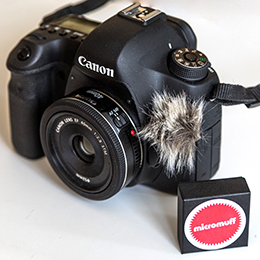 "The Micromuff actually consists of two parts – the furry wind jammer with a Velcro friendly base and then a self-adhesive, ring-shaped Velcro pad which is permanently stuck over the holes on the camera which conceal the onboard mic. My first thought was, “Do I really want to stick something to the body of my shiny camera?” Well I did, and I don’t think I ever want it to come off now that I’ve had a chance to use the Micromuff. Should you really feel the need to take it off don’t worry, it doesn’t leave behind and nasty glue residue." Compatible with any camera with microphone openings of less than 6mm across in total and with 16mm diameter space around the openings to attach the Velcro ® fastening. If it fits your camera and it's not listed above yet, why not let us know here and we'll add it to the list. If you would prefer to buy from me via Ebay - please click here to purchase!